Breathe easy with up to 1 year of ink in-box. Experience truly uninterrupted printing, exceptional savings and super convenience with up to one year of ink‡, based on printing approximately 300 pages per month, using only the cartridges provided in-box. 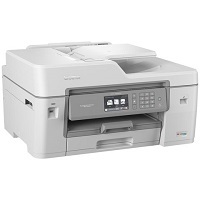 The Brother MFC-J6545DW INKvestment Tank color inkjet all-in-one printer delivers reliable performance, enhanced productivity and professional results perfect for small businesses and home offices. The MFC-J6545DW features reengineered INKvestment Tank cartridges that work with an internal ink storage tank to deliver uninterrupted printing for up to 1-year‡ without the need to purchase ink.